Prolific Academic: A mini guide on how to make money as a participant. 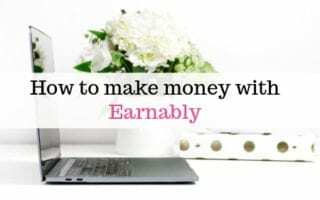 One of the easiest ways you can earn money online is by taking surveys and studies. One of my absolute favourite sites for this is Prolific. Prolific (formerly Prolific Academic) is a crowd sourcing research site where you take part in studies run by academic/scientific researchers. I like it because the studies are often a lot more interesting than on general survey sites. 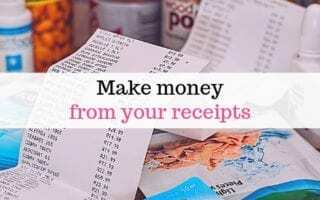 It pays in cash to PayPal and Circle Pay and is easy to use. Make sure when you sign up to Prolific that you register as a participant not a researcher. It’s easy to fill in the information and create your account. Prolific require you to verify your account in 2 methods. There are 3 options; you can verify by email, text message and Facebook. To do this you need to go to your Dashboard, then click Trust and follow the instructions to verify your account. Related: Make money taking part in consumer research. First of all, before you can take part in any studies, you will need to fill in a prescreening questionnaire. This enables Prolific Academic to match you up with eligible studies. Every so often you’ll be asked to complete extra prescreening questions; these are worth doing as you’ll become eligible for more studies. You’re usually asked to fill in more prescreening questions by a banner appearing on your home screen, but you can also find it by going to Dashboard, then Prescreening. 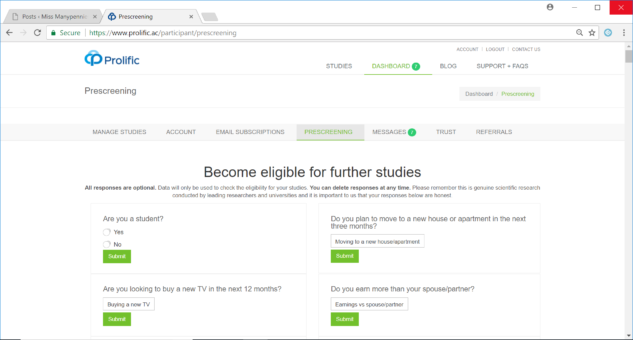 On Prolific you are only ever shown studies that you’re eligible for. On your home screen you will be shown a list of the studies available, each showing the average time it takes to complete, the amount of money you’ll be paid and what that equates to as an hourly rate. You will have a prolific ID which can be found under Dashboard – Account. This is your unique ID which each study will ask you to enter so it’s worth copying that before you begin each study so you can paste it in when asked. (It will also be shown at the top of the first page when you select a study so you can copy to clipboard from there). You will not always be notified when there are studies available. Occasionally you will receive an email but this is not always the case so it’s important to check in regularly to see if you have any studies to do. I use a Chrome browser extension called Prolific Assistant which notifies you with an alarm or browser pop up whenever an eligible study appears. On your dashboard you will find a page labelled ‘Manage Studies’. This is where you can see a list of all the studies you’ve taken part in, the name of the researcher and the status of your payment for each study. You can message the researcher from here with any queries (just click the mailbox image by the name) and you have the option to return if you no longer wish for the researcher to use your data. You can’t cash out until you’ve reach a minimum of £5 earnings. There are two payment options; PayPal and Circle. Cashing out to Paypal will incur fees of 2.9 % + 20p. Cashing out to Circle costs 1.9 % + 10p unless you wait til you’ve earned £20 then there are no fees. I always try to wait ’til I’ve reached £20 then use the Circle option as it’s free. If you don’t have Circle or want to find out more, have a look at my post on Circle here. Prolific Academic have a referral program whereby if you refer a friend they will pay you 10% of your friend’s first cash out. To make sure you’re not missing out on any studies you can download an extension to your Chrome browser called Prolific Assistant. This will make an alert to notify you whenever a new study is available. If you’re going to sign up for any survey taking sites, definitely make Prolific one of them. It’s interesting, varied, and the rewards are good. If you have a day with lots of studies available you can earn really well. One of my best days I earned £15, doing 4 studies that altogether took me less than an hour of time.